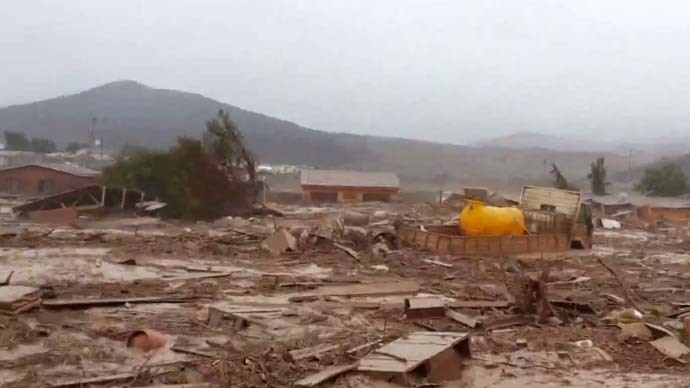 Dramatic footage of cars, trucks and whole buildings being washed away in muddy water has emerged online after thunderstorms and abnormal rainfall in Chile’s desert Atacama region caused the Copiapo River to break its banks last week. At least 25 people were killed and 125 others are missing as the floods ravaged the area known as one of the driest places on Earth. About 2,700 people are currently being housed in emergency accommodation, with around 30,000 people affected by the disaster, the National Emergency Office said. President Michelle Bachelet was forced to cancel a trip to an international summit to travel to flood-hit Atacama on Sunday. "We stand with you, as we have from the beginning, and we will rebuild," Bachelet is cited by AFP. "It pains me to see my country in such a state ... we will find a solution." The president also warned of high risk of disease outbreaks in the area, saying that government is sending thousands of doses of vaccines against flu, tetanus and hepatitis A. The heavy rains in Chile came after several days of high temperatures and a drought that caused massive wildfires in the south-central regions.